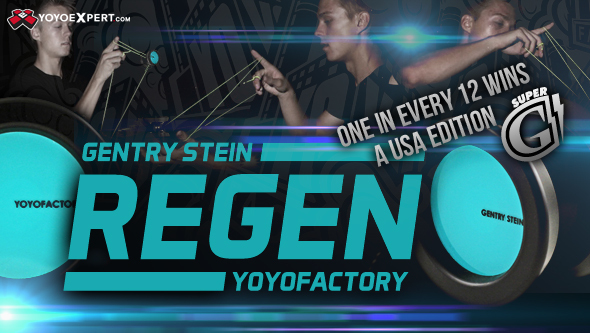 YoYoFactory - New Signature of World Champion Gentry Stein!! After an unbelievable 2014 run, Gentry Stein and YoYoFactory were looking to start the year off with something fresh. They got together to give everyone something totally new and completely unexpected. This is the Regen! The new Gentry Stein Regen is a machined plastic yo-yo, not molded. This means that it uses the same precision and manufacturing technique as your favorite high end metal yo-yos, but maintains that smooth comfortable plastic finish. The shape is reminiscent of Gentry's previous signature model, the Super G, with the strong H-shape profile and rim heavy weight distribution. The machined plastic Regen plays just as good as most metal yo-yos on the market. It is super long spinning, super stable, and so smooth that it will immediately change your mind about plastic! The Regen is limited in production, after this release YoYoFactory will not make it again! The first and final release is available in black or white and comes stock with a Center Trac Bearing. Note: Special USA Super G PROMOTION! 1 in every 12 orders will at *RANDOM* receive a USA Super G yo-yo with your order! Good luck to everyone! While Supplies Last!